Today is the summer solstice, on which I traditionally post about archaeoastronomy, which is a major topic of interest in studying Chaco Canyon. 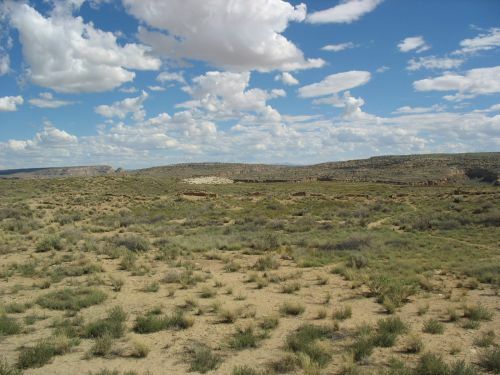 Lately, however, I’ve been very busy and have not been keeping up on recent developments in Chaco studies (not helped by the fact that I don’t currently have access to the academic databases where recent research can be found), so this time I thought I would talk about the archaeoastronomy of a fascinating and unjustly obscure site in a different part of North America, the Pinson Mounds site in western Tennessee. I visited Pinson a few years back more or less on a whim; I was driving across the country after finishing grad school, taking a meandering route and hitting a variety of archaeological and historical sites as I went. Pinson was not originally on my list of sites to visit, but for some reason that I no longer remember I decided to go there as I made my way through the Mid-South. It was a good decision. 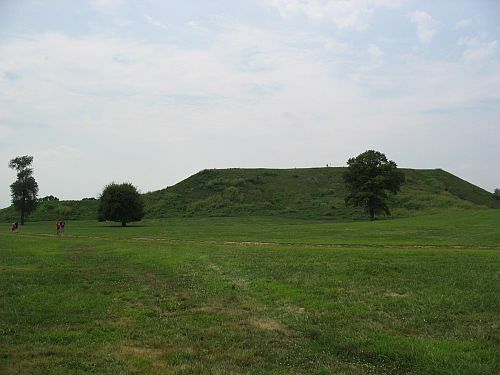 There are a lot of prehistoric mound sites in the Southeast, and at first glance Pinson doesn’t seem particularly distinctive among them except that one of its mounds, known as Sauls Mound or Mound 9, is unusually large. And indeed, although the site was first documented in 1823 it was not until the 1970s when it became a Tennessee state park that extensive archaeological work was done there and its true nature became apparent. There are various types of mounds at Pinson, but the most prominent, including Sauls, are of the type known as “platform mounds” which are square or rectangular, often with buildings of presumed ritual function at the top, and are generally associated with the Mississippian period of circa AD 900 to 1600. Earlier Woodland period mound sites are more known for burial mounds, which are typically rounded or conical without buildings on top, with the Hopewell Culture sites in Ohio being the most prominent examples. The platform mounds at Pinson, along with a single house of Mississippian “wall-trench” form excavated back in the 1960s, led most archaeologists to assume that this was a relatively minor Mississippian site until the excavations of the 1970s and the resulting radiocarbon dates showed that it actually dated to the Middle Woodland period in the early centuries AD, contemporaneous with Hopewell. And some of these dates were directly associated with the platform mounds, demonstrating clearly that they too dated to this early period! This led to a major reëvaluation of the Middle Woodland period in the Midsouth, which is in some ways still ongoing. It also led to the reëvaluation of some other platform-mound sites in the same general area which also ended up dating to the Middle Woodland. It remains unclear what the exact nature was of the relationship between these precocious southern platform-mound sites and the contemporaneous Hopewell sites to the north, and the same is true of their relationship to the later Mississippian sites. One thing that does appear to be true of these sites, however, as well as of the Hopewell ones, is that they were primarily ritual or ceremonial centers without substantial residential components. They appear to have served dispersed communities of small hamlets, who were likely small-scale farmers growing indigenous plants of the Eastern Agricultural Complex. This is in contrast to Mississippian mound centers, which are now considered to have been large residential settlements of farmers growing crops of Mesoamerican origins (especially maize). Also unlike the strongly hierarchical Mississippian chiefdoms, Middle Woodland communities are also generally thought to have been relatively egalitarian in structure. Some of these ideas may seem familiar to those familiar with Chaco. A similarly egalitarian structure has been proposed by some archaeologists to explain Chacoan great-house communities, based on models proposed by earlier generations of archaeologists to explain the Classic Maya polities. These models are now falling out of fashion for Chaco, much as they eventually did for the Maya, based on new research that makes them less tenable. It might seem odd that they have remained so tenacious for the Hopewell and other Middle Woodland societies in the east, but they have, which to me suggests that they really might be on to something here. I know a lot of people find these explanations of Chaco as an empty ceremonial center for a dispersed society of small-scale egalitarian farmers inspiring as a vision of what a society can be; as Chacoan research makes this a less plausible reconstruction they may wish to turn their eyes eastward, and further back in time, for a better example. Anyway, on to the astronomy. The arrangement of the mounds at Pinson, as at many other Hopewell/Middle Woodland sites, has suggested to archaeologists for a while that there might be astronomical aspects to the site. One extensive, though admittedly speculative, exploration of this idea was published by Charles H. McNutt in a 2005 paper, which I will focus on here. 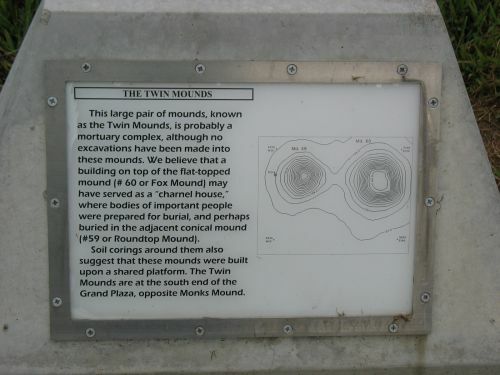 McNutt proposed that Sauls Mound was the central focus of a set of astronomical alignments with other mounds at the site, and he compared the angles of these various inter-mound alignments to rising and setting positions of the sun, moon, and stars. The most straightforward of the alignments he found were to solar events, i.e., the solstices and equinoxes. Mound 29 is due east of Sauls Mound within a circular feature known as the Eastern Citadel (which may have its own internal astronomical features), and it appears that this relationship may represent an equinox sunrise marker. Mound 28, northeast of Sauls Mound at a similar distance to Mound 29, has been proposed as a summer solstice sunrise marker (as indicated by a sign posted at the site, even), but McNutt found that it is not really close enough to the solstice alignment for this to be plausible. However, another mound indicated on early maps of the site, but not visible today, does appear at the proper angle on those maps to have been a solstice marker. McNutt describes other possible alignments, to the lunar standstills as well as various stars, but he is rightly cautious about these and notes that the stellar alignments in particular are dubious because there are so many stars that alignments can easily arise due to chance. 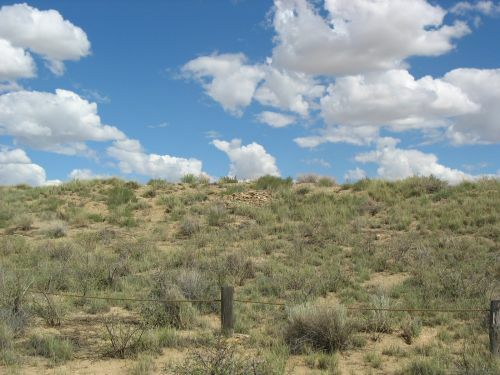 He then goes on to look at other contemporaneous mound sites in the same general area to determine if they have similar possible alignments, and finds that they do, although the quality of the data is not great for all of them and these too need to be treated with caution. Finally, McNutt ties the existence of these celestial alignments back to the presumed reliance of the Middle Woodland people on agriculture, specifically of the crops of the Eastern Agricultural Complex. Farming peoples do rely on accurate calendars, it is true, and this may well have been the impetus for the astronomical observations that appear to be encoded at Pinson and other sites. I would note, however, that the immense effort required to build these mounds, especially for a dispersed and relatively egalitarian society, suggests that something more than utilitarian timekeeping needs led to their construction. But this may ultimately be a matter of perspective and emphasis more than anything else. I may have more to say about Pinson in the future; it really is a fascinating place, well worth visiting. But for now I just want to draw some attention to it on this solstice day. Happy solstice! One of the major areas of interest for the “New Archaeologists” who came to dominate American archaeology in the late twentieth century was mortuary analysis. In keeping with the arguments of Lewis Binford and other leaders of the movement that archaeology as a discipline should be “problem-oriented” and focused on reconstruction prehistoric societies as fully as possible using archaeological evidence, the patterning evident in the way those societies disposed of their dead was held to reveal important information about social structure and the positions held by the deceased in life. Many important studied of mortuary behavior in various cultures were published in this period, including a 1984 article by George Milner on the burial patterns of Mississippian sites in the American Bottom of southwestern Illinois. Milner’s article is a classic example of the New Archaeology as applied to mortuary patterns, hampered only slightly by the immense complexity of Mississippian mortuary behavior and the scanty evidence from the many burials excavated in the nineteenth century and poorly documented. Noting that most Mississippian burials in this area were placed in dedicated cemetery areas, he divides these cemeteries into three broad categories, reflecting two dimensions of variation in social structure. The categories are elite burials at major centers such as Cahokia, non-elite burials at those same centers, and non-elite burials at peripheral sites (which do not appear to contain elite burials). By far the most and best information available to Milner was from the third category, and this is the one he focuses the most attention on. There is quite a bit of diversity even within this category of cemetery, but some general patterns do emerge. Cemetery sites are typically either on prominent bluffs above the Mississippi River floodplain or on low ridges within the floodplain, with a trend apparent over time of a shift from the former to the latter. The bluff-top cemeteries tend to be quite large, and they probably represent the dead of multiple rural communities in the general area. This inference is backed up by the diversity of mortuary treatments even within these cemeteries. Some burials are intact, articulated skeletons, often laid out in one or more rows, sometimes with the heads pointing toward a nearby mound center. Others are disarticulated jumbles or bones, often containing the remains of multiple individuals. There is considerable evidence of complicated mortuary treatment involving exposure of the bodies for some period after death, perhaps in the “charnel structures” that accompany some of the cemeteries, followed by secondary burial. Grave goods are rare and usually relatively mundane items such as pottery, although shell beads and certain exotic minerals are found in some cases. Ironically, burials at the major mound sites are generally poorly documented compared to those in the rural hinterland. This is in part because the former were often excavated haphazardly in the nineteenth and early twentieth centuries, with little or no detailed documentation, while the latter have been largely excavated by systematic cultural resource management salvage projects more recently and extensively documented. Nevertheless, Milner combed through the available data on the mound center burials in the American Bottom, and he comes to a few tentative conclusions about them. For one thing, there is definitely a big difference between the elite and non-elite burials. The non-elite burials are similar to the ones at outlying sites in many ways, including linear arrangements of graves and modest assemblages of grave goods, but there is also more substantial variation in mortuary treatment, which Milner plausibly attributes to greater diversity within the more populous mound communities, perhaps including more subtle gradations of status than are accounted for by his crude “elite”/”non-elite” dichotomy. The elite burials, however, are quite different. They are generally in mounds, specifically in conical mounds as opposed to the flat-topped ones that served as platforms for buildings. 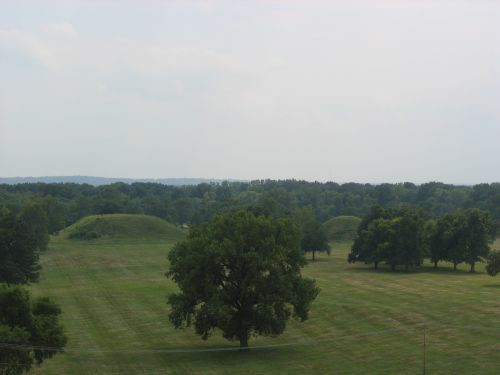 A common pattern seen at Cahokia and other sites, is for mounds to be paired, with a conical mound accompanying a platform mound. The Fox and Roundtop mounds (the so-called “Twin Mounds”), south of Monks Mound on the opposite side of the Grand Plaza, are the best-known of these paired mounds, but since they are largely unexcavated relatively little is known of their contents. 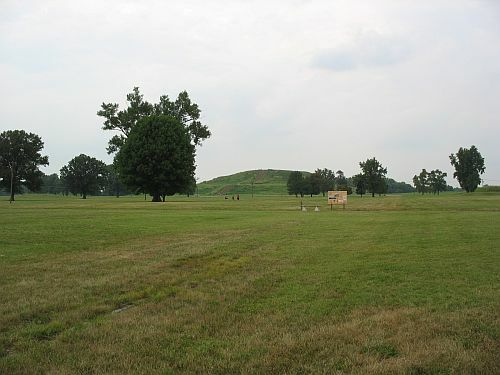 Much of the Cahokia data Milner uses comes instead from Mound 72, which was excavated relatively recently and extensively documented. The very complicated mortuary deposits in this mound include two burials associated with numerous shell beads, as well as various other groups of both articulated and disarticulated remains. One group of articulated skeletons was missing skulls and hands, apparently indicating some sort of human sacrifice. One of the most striking ways the elite burials differ from the non-elite ones is in the sorts of grave goods. Mundane items such as pottery are generally rare, while very elaborate, labor-intensive artifacts are numerous. The shell beads from Mound 72, also common in several of the other mounds Milner discusses, are one example. 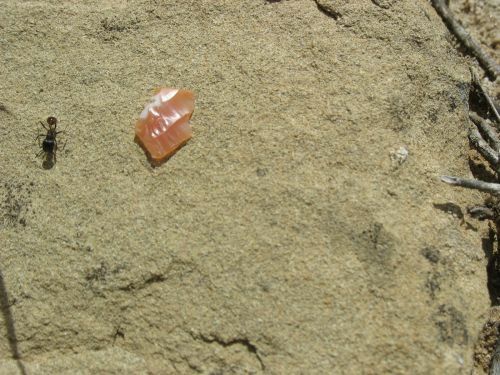 Mound 72 also contained various other items, including a cache of finely made chert projectile points, and other exotic materials including copper items were found in other mound burials. Another interesting characteristic of the elite burials Milner describes is that they are quite communal in nature. Individual burials are not present, and even the most elaborate assemblages of grave goods seem to be associated with large groups of burials within the mounds. This may have important implications for the nature of political power in Mississippian society, although Milner doesn’t go into the implications in any detail in this paper. Some of Milner’s conclusions in this paper have been superseded in part by newer discoveries and refinements to the chronology of the American Bottom since the time he wrote, but this is still an important paper, not least because of the way it draws on what information is available on the early excavations. The tentative nature of Milner’s conclusions is due in part to those data limitations, but also to the fact that what becomes glaringly obvious from this work is that Mississippian burial practices were extremely complicated and shaped by a wide variety of possible factors, not all of them easily discernible from this type of study. 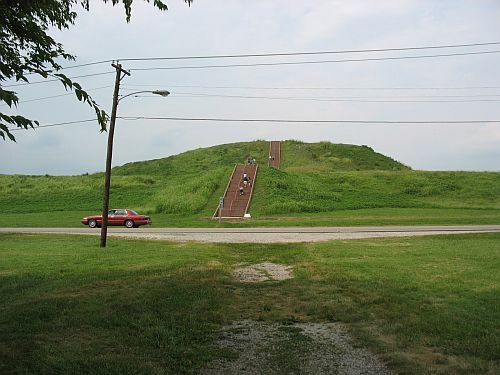 Monks Mound is both the largest mound at Cahokia and the largest at any Mississippian site, by a huge margin. It’s 100 feet high and about 1,000 by 800 feet at the base, covering more than 18 acres. Its mass is five times that of the second-largest Mississippian mound (Mound A at the Etowah site in Georgia). The thing is just gigantic, and it has long been of intense interest to archaeologists. Back in the nineteenth century there was considerable debate over whether it was an artificial mound at all rather than some sort of unusual natural formation, and even into the early twentieth century there was some discussion of whether it might have been a natural rise of some sort that was built up artificially. Those debates had largely been settled by the 1960s, with increasing evidence that it was in fact an artificial construction like the smaller mounds surrounding and forming the core of the Cahokia site around the Grand Plaza. There still remained a dearth of detailed information on the composition of the mound, however, and after some excavation of various small parts of the mound in the early 1960s the archaeologists working at Cahokia came up with the idea of doing some core drilling to get a more general sense of its composition. They reported their results in a paper published in 1968. After reviewing the techniques available to them, the researchers decided to go with the heaviest equipment they could find, a truck-mounted rig used to take soil samples for highway and building construction. This rig worked by ramming a three-inch diameter tube down at two-foot increments, after each of which the core sample would be extracted and a new tube attached to take the next two-foot sample. This worked pretty well, although some of the tubes broke loose, broke, or were otherwise lost in the course of drilling. The clay soils of the American Bottom are notoriously tough on equipment, so it’s probably a good thing they chose the most heavy-duty rig they could. They found that the core samples were somewhat compacted from the pressure of the drilling, but this didn’t end up being a major problem for interpreting them. To check on the accuracy of interpretations derived from the core sampling, a small area adjacent to one of the sampling holes was excavated to get a better look at the stratigraphy. 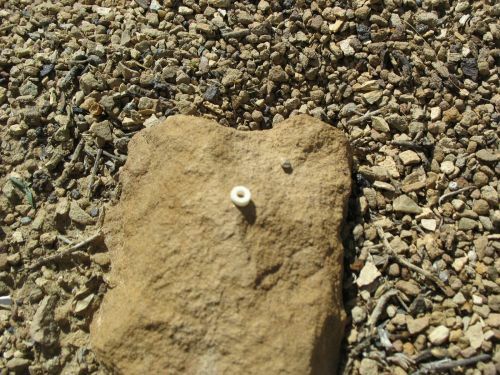 This digging generally confirmed the interpretation of the cores, especially the interpretation of thin bands of limonite, which often forms on exposed surfaces in this area, as indicating discrete construction stages of the mound. The coring and excavation also resulted in the submission of a few pieces of wood for radiocarbon dating to give a sense for the absolute chronology of mound construction. Since this was early in the history of radiocarbon dating, the standard deviations on the resulting dates are so large as to make the results of limited usefulness in delimiting substages within the Mississippian period, but they do show the general period when the mound was most likely under construction to be between AD 800 and 1300, which matches the dating of the Emergent Mississippian and Mississippian periods at Cahokia. Probably the most important result of this research was the discovery that two of the major construction stages, including the earliest, consisted of massive deposits of black clay which likely came from topsoil deposits in various areas around the mound. 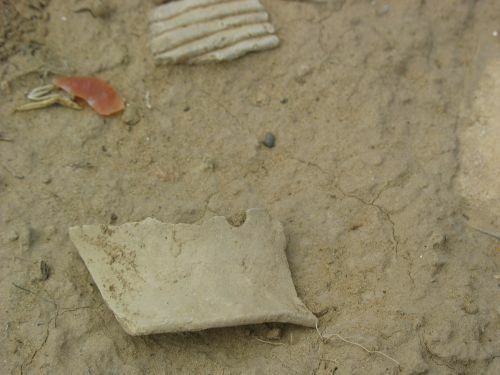 The later paper I discussed earlier suggested that some of this clay may have come from the upper layers of the area to the south that would later be filled in to become the Grand Plaza, while the authors of the original paper suggested that some of it may have come from the area to the north along Cahokia Creek. It probably took a hell of a lot of clay to build these layers, so both could easily be right. Another interesting proposal from the authors of the coring paper is that the other mounds at Cahokia may have postdated Monks Mound. This is based on the fact that the handful of radiocarbon dates from excavations beneath other mounds that had been obtained as of that time were uniformly later (though not necessarily very much so) than the dates obtained from the coring and excavation at Monks Mound. 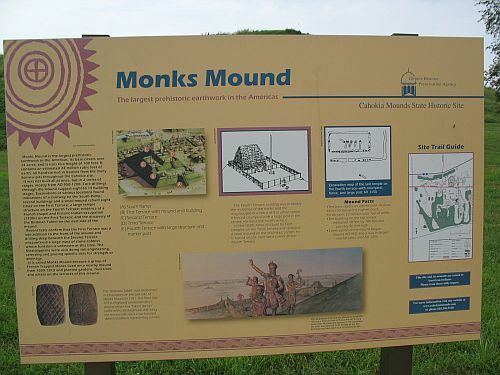 This idea is supported by the fact that some of the other mounds are clearly aligned with Monks Mound. There has been a lot of excavation and reanalysis of older materials since the 1960s, of course, so I’m not sure if this pattern still holds up. Monks Mound is both so huge and so important that this sort of broad-scale coring, like the conductivity survey done later in the Grand Plaza, is a reasonable way to quickly get a general sense of patterns that would take much longer to uncover via excavation, which might not even be possible to do on account of preservation concerns. This is therefore a pretty important paper. Even though it doesn’t reveal a whole lot of detail about the construction stages of Monks Mound, it’s unlikely that we’ll get much more detail than this without a seriously huge effort. Mississippian societies are known for their mounds, but there’s more to them than that even if you just look at community layout at the largest centers. One of the most distinctive characteristics of Mississippian mound centers is that the mounds at the biggest centers are typically grouped very formally around a central plaza. Historic records of the Mississippian societies in the Southeast that survived into the sixteenth and seventeenth centuries give some sense of the uses of these plazas, which as you might expect seem to have centered on communal ritual, feasting, games, and other events that brought people together and solidified the authority of the elites who lived on the mounds and governed the commoners. Archaeologists have been slow to give plazas the same level of attention they’ve given mounds for a long time, however. There’s long been a tendency to view them as simply empty spaces devoid of interest compared to the impressive mounds that surround them. That has started to change over the past twenty years or so, however. One of the early efforts in this direction was a field school at the biggest and most spectacular Mississippian site, Cahokia, in 1989. 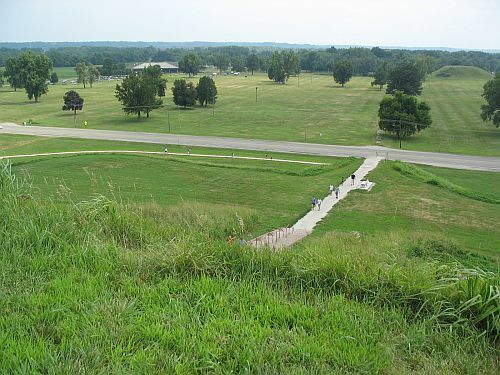 The results of this research were reported in an article published in 1993, and they reveal that there’s more to Cahokia’s Grand Plaza than meets the eye. The American Bottom, where Cahokia is located, is characterized by a relatively flat but gently rolling terrain resulting from many years of the Mississippi River winding its way across the floodplain, creating a wide variety of sand ridges interspersed with lower swales filled with alluvial silt and clay. 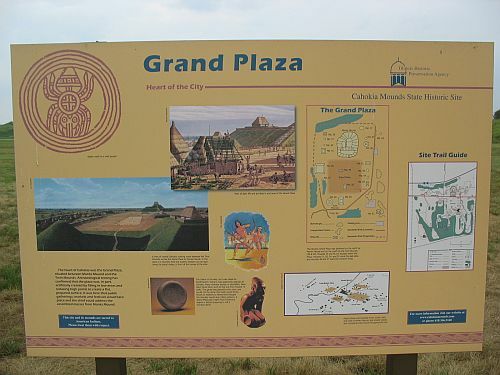 Given this context, the flatness of the Grand Plaza calls out for some sort of explanation. One possibility is that this is an area where natural deposition of sediment happens to have filled in the swales and covered over the ridges, creating a particularly flat area that the Cahokians took advantage of as a natural plaza site by building mounds around it. Other parts of the Cahokia site that have been excavated appear to have been built on similar natural flats. 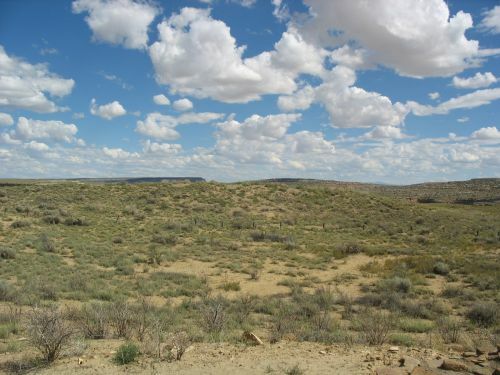 The other option is that the Cahokians themselves took an area that was dominated by the usual ridge and swale topography and flattened it out by cutting down the ridges and filling in the swales to create an artificially flat plaza. If this were the case it would obviously have important implications for the amount of labor that went into the building of Cahokia, which in turn would be an important factor in understanding the nature of the site and of its influence in other areas. To investigate this question the researchers started with an electromagnetic conductivity survey of the western portion of the Grand Plaza. Since sand tends to have a lower conductivity than silts and clays, sand ridges should show up in a survey like this as areas of lower conductivity compared to swales. This sort of survey should also pick up underground borrow pits (where material was dug for use in mounds and other construction) that were later filled in, provided the later fill was different in conductivity from the surrounding soil. The survey was followed by core sampling to confirm the results, then by limited excavation of a few blocks in the plaza to get a closer look at the stratigraphy of areas that came up with interesting survey results. The conductivity survey found that there was indeed a subterranean sand ridge under part of the plaza, with apparent swales on either side of it. Some apparent borrow pits also showed up. The coring confirmed these results, and five excavation blocks were dug: two on the ridge, two in an adjacent swale, and one in a possible borrow pit. The excavation results showed pretty clearly that the final flat condition of the plaza was indeed the result of human action rather than natural deposition. There was a very sharp delineation between the underlying natural deposits of both the ridge and the swale and the overlying fill, which contained varying amounts of artifacts and did not look anything like natural alluviation. This was also the case for the borrow pit, where the fill was indeed quite different from the surrounding material and clearly secondary. From the artifacts found in the fill, it appears that the leveling of the plaza occurred around the time of the transition from the Emergent Mississippian to the Mississippian period, which current dating places around AD 1050. Interestingly, it appears that the leveling was actually a secondary activity after the area had been pretty thoroughly dug over for fill, perhaps to build the early mounds at the site. This means that this may in fact have originally been a naturally flat area (although there’s really no way to be sure) but that the upper layers of soil were stripped away for mound construction early on, only to have the resulting pits and scars covered up later by fill that created the final plaza surface. The authors propose a tentative scenario in which early mound construction during the Emergent Mississippian period took fill from this area, which was at the time away from the main area of occupation along Cahokia Creek to the north, and it was only later, when Cahokia began to really hit its stride, that plans changed and this area was refilled to become the Grand Plaza. Whether this was the case or not, it’s very clear from this study that the history of the Grand Plaza is a lot more complicated than it looks at first site. The greatest of the Mississippian mound centers, by far, is Cahokia. 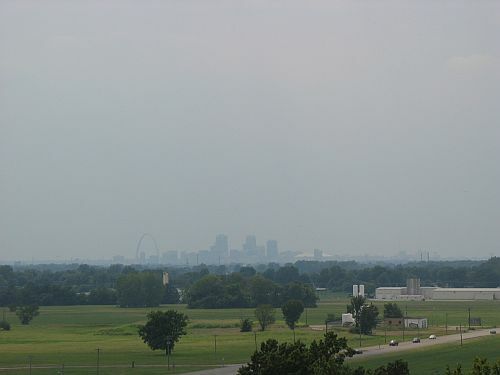 This vast site contains numerous mounds and is located in the American Bottom area of southwestern Illinois, across the Mississippi River from the modern city of St. Louis, Missouri. This is a highly strategic location, very close to the confluence of the two largest rivers on the North American continent (the Mississippi and the Missouri), and about twenty years ago Peter Peregrine published a short paper using graph theory to demonstrate that Cahokia was located at the point of highest centrality in the entire Mississippi drainage, potentially giving Cahokia’s inhabitants the ability to control riverine trade across a large portion of the continent. In addition, the American Bottom is an area of very fertile bottomlands along the Mississippi potentially allowing for substantial agricultural surpluses. As early as 1964 Charles Bareis noted that the configuration of the mounds at Cahokia relative to the meander loops where the Mississippi had changed its course over time indicated that the river had been relatively stable over time in this region, changing its channel much less frequently than in areas further downstream. The combination of fertile soil and a relatively stable, predictable river could have combined with the strategic location within the river system to provide the conditions under which Cahokia rose to prominence. Ecological/geographical explanations like this for the rise of “complex” societies like Cahokia were quite popular among processual archaeologists from the 1960s to the 1980s, but they have since been challenged by a newer generation of archaeologists influenced by the post-processual movement that began in Europe. As Michelle Hegmon noted in an important summary of the theoretical status of North American archaeology a few years ago, Americanists have generally not been inclined to go all the way over to European-style post-processualism, instead adopting elements of both processual and post-processual approaches in varying ways. Hegmon labels the resulting theoretical orientation “processual-plus,” and that seems like an apt description to me. Now I don’t know the demographic data for Cahokia and its hinterland, but I think the population density within the Cahokia urban center was probably HIGHER than within Maya cities, but the population density of the “Greater Cahokia” region was most likely lower than that of the Maya lowlands. The high density of Maya regional populations (how many people lived on the landscape, whether in large or small settlements) is one of the remarkable features of ancient Maya society. I’d be interested to see how Cahokia fits in comparison with these figures. Population estimates for Cahokia vary, as you might expect, but I figured I could chime in with Pauketat’s estimates from his 2003 paper. It’s important to note here that Pauketat is an advocate for a larger, more urban Cahokia than that seen by some other archaeologists, so his figures are relatively high compared to some other estimates, but he goes into some detail in this paper about where he gets his figures and his procedure seems reasonable to me. 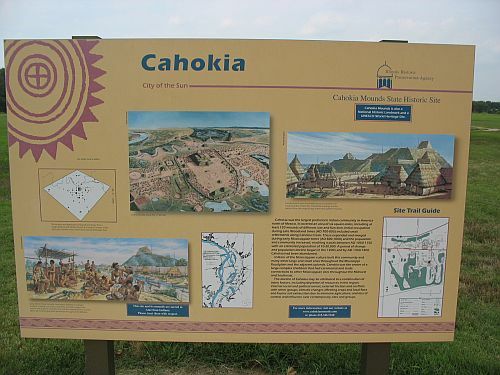 For the core area of Cahokia, which is about 1.8 square kilometers in area, Pauketat calculates a population range of 10,000 to 16,000 people at the site’s peak during the Lohmann Phase (ca. AD 1050 to 1100), which equates to a population density of about 5500 to 8900 people per square km. As Smith suspected, this is much higher than Classic Maya cities like Tikal. Indeed, it’s much higher than contemporary St. Louis, which has about 2000 people per square km, and at the high end it approaches the density of New York! Calculating the regional density is trickier because of limited survey coverage in some areas, but for the 300-square-km Richland Complex specifically (a relatively dense rural area), Pauketat calculates a population range of 3000 to 7400 people for roughly the same period, which equals a density of 10 to 25 people per square km. Again, as Smith predicts, this is much lower than the Maya regional density and down with the more sparsely populated US states like Arizona. It’s lower than both Illinois (89 people per square km) and Missouri (34 people per square km) today. There’s way more to say about Cahokia. The literature on this site is vast, not unlike the literature on Chaco. (Observant readers may have noted some striking similarities between the two sites, which I’ll discuss later.) Given that Cahokia is widely acknowledged these days to have been a city, population density is a useful way to look at it and to compare it to other cities. There are other aspects of this fascinating site worthy of discussion, however, and I’ll have much more on it soon. Meanwhile, across the short stretch of water to Dhaskalio, a very different picture was emerging. From the outset, the islet showed evidence of having been a major Bronze Age stronghold with structures built on carefully prepared terraces circling a summit, on which a large hall was erected. The settlement dates from around the time of the Special Deposits, and then continued to operate before being abandoned around 2200 BC. 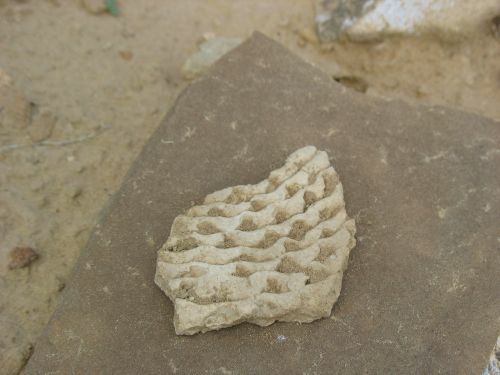 Examination of its geology showed that the beautifully regular walling of the settlement was imported marble rather than the flaky local limestone found on Keros. Remarkably, in the same era the pyramids were being built and Stonehenge erected, Cycladic islanders were shipping large quantities of building materials, probably by raft, over considerable distances to build Dhaskalio. Here, too, there were puzzling finds: a stash of about 500 egg-shaped pebbles at the summit and stone discs found everywhere across the settlement. And, although there was evidence that the olive and vine were well-known to the inhabitants of Dhaskalio, the terrain there and on Keros could never have supported the large population the scale of the site implies, suggesting that food also was imported. Readers who are familiar with Chaco will probably have realized by now why I’m talking about this, as it’s eerily similar to a lot of recent interpretations of Chaco Canyon as a destination for pilgrims who brought in vast amounts of pottery, wood, and other materials as part of some sort of ritual system focused on the canyon but also including the whole area throughout the San Juan Basin and beyond in which Chacoan “outliers” are found. There is even evidence that food was being imported to Chaco. 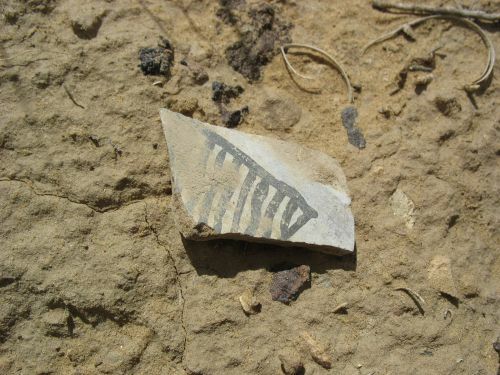 The Chaco Project‘s excavations at Pueblo Alto uncovered evidence in the trash mound of repeated events in which huge numbers of pots were broken, which some have interpreted as evidence for ritual breakage of pottery (though not everyone agrees with this). This sort of pilgrimage model is one way to explain the rather inexplicable findings of huge amounts of material being imported to Chaco but basically nothing coming out. It also potentially offers a way to explain the apparently low permanent populations of both the canyon as a whole and the individual great houses, and one version (espoused by Wolky Toll) even posits that there may have been virtually no permanent population at all, with the small houses that comprise the bulk of the residential space in the canyon having only been occupied seasonally or for special gatherings by people who spent most of their time in the outlier communities. What’s particularly interesting about this comparison is that Renfrew himself, in an article stemming from one of the Chaco Project capstone conferences, proposed a model like this for understanding Chaco as a “Location of High Devotional Expression” or “LHDE.” The article is quite reasonable and measured in pointing out the characteristics of such a center and how Chaco seems to fit pretty well, although Renfrew really seems to go overboard with the use of the passive voice to a greater extent even than most other archaeologists. He acknowledges that some known LHDEs are part of hierarchical societies or states and are often associated with political or economic authority, but he emphasizes that this is not necessarily the case and that many well-known examples such as Stonehenge seem to have clearly been built by egalitarian societies. 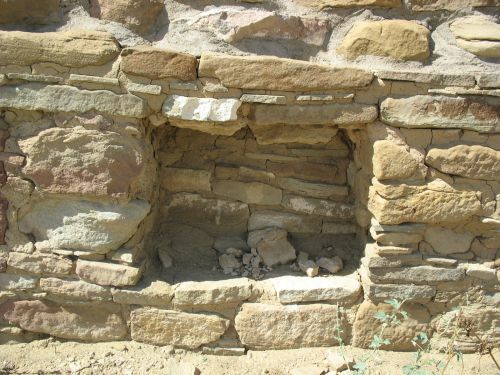 The implication is that Chaco may have been egalitarian as well, an idea near and dear to the heart of a certain type of Southwestern archaeologist and still quite deeply entrenched in both Southwestern archaeology and popular perception. He does note that the rich burials in Room 33 at Pueblo Bonito are problematic for this interpretation, but like most people proposing egalitarian models for Chaco he doesn’t really pursue the implications of that. My approach to Chaco is colored by my experience of several early societies that are by no means urban but which can nonetheless boast impressive monumental constructions and other presumably symbolic features. Prominent among these are the so-called “temples” of prehistoric Malta, the ahu of Easter Island, and in particular the henges and other prehistoric monuments of Orkney. It would seem his approach to the Cyclades is similarly colored. Thus the title of this post, although it is admittedly unfair, as Renfrew has a done a lot more in his long career than this LHDE stuff. Still, I think it’s interesting to see the way archaeologists’ backgrounds can influence how they perceive novel sites and societies. In many cases this can lead to important insights that people who have been myopically focused on that society for decades may have missed, and there is some interesting and useful stuff in Renfrew’s article along these lines, but his clearly (and admittedly) superficial knowledge of Chaco leads him to not seem to realize that many of his arguments for an egalitarian Chaco are basically old wine in new bottles. As alternatives to his LHDE model he evaluates two other models, which basically correspond to the “Mexicanist” idea of Chaco as a trading center providing turquoise to Mesoamerica and the “indigenous complexity” model of Chaco as an “elite power base.” These are indeed two of the models that have been frequently put forth to explain Chaco, but there are others, including some egalitarian ones quite similar to his own. He acknowledges this to some degree, but he again doesn’t really go into the details. I don’t mean to criticize Renfrew too harshly here. He’s clearly a very smart guy, and Chaco is well outside his areas of expertise, so he can be forgiven for not being totally aware of all the nuances of Chacoan research. His article is probably the best summary out there of the evidence for Chaco as a pilgrimage center and what that might mean. As I said above, this is a popular idea these days among a lot of archaeologists who otherwise disagree about the exact nature of Chaco. I have expressed some fondness for it myself in the past, but I’m now starting to reconsider. It’s an attractive way to explain a lot of things about Chaco, but it has the distinct disadvantage of not having any direct evidence supporting it. Any pilgrimage model is therefore sort of inherently speculative about who these pilgrims were, where they were coming from, and why. This isn’t to say that I think Chaco was definitely not a pilgrimage center, but I’m not really convinced that there’s any particular reason to believe it was, based on the evidence we have. The strength of models involving pilgrimage will just have to depend on the strength of the evidence supporting the other aspects of the models, I think.